This PM brushless machine design book was written with a focus on actual engineering practice and tries to deal with most of the questions that arise on a daily basis. It is generously illustrated in color as the authors have tried to catch up with the progress over the last 16 years of PM brushless machine design and development since their well-known 1994 book. The new book includes also many more examples. Almost the entire work is the direct result of intensive consulting by the authors, in collaborating with many of the leading producers of brushless permanent-magnet machine products worldwide. Much of the theoretical material has been evolved from SPEED’s Electric Machines, the theory text that accompanies the SPEED PC-BDC software developed by Prof. MILLER. The authors’ partnership is a longstanding combination of theoretical, practical and consulting experience, while the book with its rich illustrations of industrial products celebrates the rich engineering accomplishments of design engineers from all over the world. 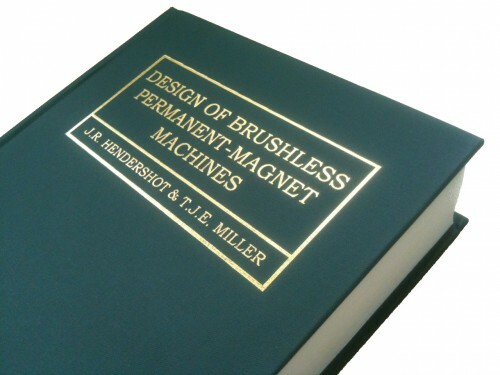 Chapter 1 begins with definitions of the basic concepts of PM brushless or synchronous machines. Chapter 2 is a review of the main types of brushless PM machine, and is essentially a gallery of examples. Chapter 3 addresses the initial basic design questions such as number of slots & poles, choice of interior or exterior rotor and other design decisions. It includes treatment of dimensioning, cogging, winding manufacture, AC resistance, and magnet retention. Chapter 4 covers the basic electromagnetic theory of motors and generators, including square-wave and sine-wave operation. Chapter 5 provides a thorough analysis of inductance, including all its components: air-gap, slot-leakage, end-turns, differential, and synchronous inductance. Chapter 6 covers commutation, current regulation, phase advance, regeneration, dwell control, and back-EMF sensing for square-wave drives. Chapter 7 is a complete account of the theory of sine-wave drive control including detailed descriptions of the main electronic current control schemes. Chapter 8 is the most rigorous study of the EMF and torque constants kE and kT yet published. Chapter 9 is a comprehensive treatment of PM generators. Chapter 10 is a specialized treatment of multiple-phase machines, 6 or 9 phases. Chapter 11 covers three-phase and single-phase line-start motors. Chapter 12 is a detailed treatment of machine losses and cooling. Chapter 13 is about the testing methods of PM brushless machines. Chapter 14 is a detailed chapter on frequently asked questions by machine designers.